FromINYAN Article Save My Shabbos Meals! If you were to recall one scene from your childhood, what would it be? Mindy is divorced. For 12 years, her Shabbos table hasn’t had a man at its head. To compensate, Mindy would croak out some zemiros, which of course the kids hated. When she tried to say a dvar Torah, it sounded stilted and awkward. She wondered how men pulled it off so easily. It hurt her so much to think she was depriving her children of a proper Shabbos table experience. Eventually, she gave up. She thought she would never have her dream Shabbos meal. And it hurt. “I always dreamed of a home where the Shabbos meals would be the highlight of the week. There would be guests and divrei Torah and loud, harmonized zemiros and stories. Lots and lots of stories of tzaddikim to inspire my future children to be kind and humble and have yiras Shamayim. “Well. It didn’t take too long after my marriage to realize Shabbos meals in my husband’s mind and Shabbos meals in my mind could not merge. They were on different brain spheres, I think. “In my husband’s home, Shabbos meals passed as follows: Kiddush. Wash. Challah. Fish. Eat. Chicken soup. Slurp. Chicken and potato kugel. Eat. Dessert. Eat. Sleep. Kiddush through bentching was done in a grand 20 minutes. More children at the table? Well, add another minute or two. “This is what my husband grew up with. This is the reality he knew. When we began to make Shabbos on our own, it was 30 minutes and the meal was complete, and that included nursing time for the baby! “Once, I made the mistake of inviting my brother and his friends. Oops. That was an awkward meal. We had the occasional guest but, suffice it to say, I did my best to dissuade them. Most who did come were happy not to come again. “As the children grew, the meals continued in this vein. I watched in dismay as my dream Shabbos slowly ebbed away. There was nothing I could do, right? Leading a Shabbos meal was the husband’s job. If he wanted ruchniyus and happiness at the Shabbos meal, it would happen. If he wasn’t interested, well, there wasn’t much a woman could do besides pleading and kvetching and begging for him to change. “I went down that dangerous path. Guess where it got me? Nowhere. Our Shabbos meals continued to be a blah experience. I tried improving the areas to which, traditionally, a woman can contribute. I set the table with beautiful napkins, stunning stemware and invested in gold napkin rings. I cooked delicious food, glamorous desserts. I bought popcorn and nuts to go with the never-happening shmoozing sessions I envisioned. No change, though. I mean, we all enjoyed the better food and the beautiful presentation, but ruchniyus? Uh, no. “My son was growing up. A slapdash Shabbos table was his reality. Though the quick Shabbos meals seemed quite beneficial for his abundant energy levels, my mother’s intuition knew that he needed more. More ruchniyus, more life in the Shabbos meals, more to keep him grounded. “At that time, I asked a brilliant Rabbi a different question concerning this son. I asked him what I could do to keep him connected to Yiddishkeit. The answer I received was a life changer. “He told me that just as a child grows physically and we adapt by buying him bigger clothes, treating him more maturely, etc., a child also grows spiritually. What was a good fit when he was younger will no longer ‘fit’ when he grows older. Our job as parents is to help the process. A growing parent will have growing children, as the children see that the parent is constantly looking to improve. If we become stronger in ruchniyus, so will our children. “Wow. I must admit I was stagnant as a lake at that point. Grow? That was reserved for the seminary years when we reached abnormal heights. I was meant to grow now, with tiny people who were constantly causing me sleep deprivation? “But I saw the truth and decided that I would try. Money and time I didn’t have, so the only option was to listen to shiurim from my home while I was cleaning or cooking. I had an earbud in my ear constantly. “The stuff I learned! There’s a world of beauty out there! I learned the parashah on a whole new level. I heard contemporary stories, stories of old-time tzaddikim, halachos I never knew, depth of knowledge I could only dream about. I could not believe this stuff existed. There was so much that I felt I was about to explode. “When I heard a question on the parashah I knew my big kids would enjoy, I asked it at the Shabbos table even if I didn’t know the answer. Slowly, our Shabbos table became alive and stretched a bit longer. The kids now too shared their stories, but they mainly looked at me when they shared. I really disliked taking over my husband’s role and taking away the seat he needed to fill, but I was loving the change. “I tried leaving the shiurim on speaker so that my husband could hear when he was home. There was one particular speaker who is fire; his speeches are full of positive energy. My husband seemed to like what he was hearing and I would try to have this speaker on as much as possible. For two years, I ran the show and then, one day, my husband heard a fantastic story. And I nearly fell off my chair when he shushed the kids and shared the story at the Shabbos table. 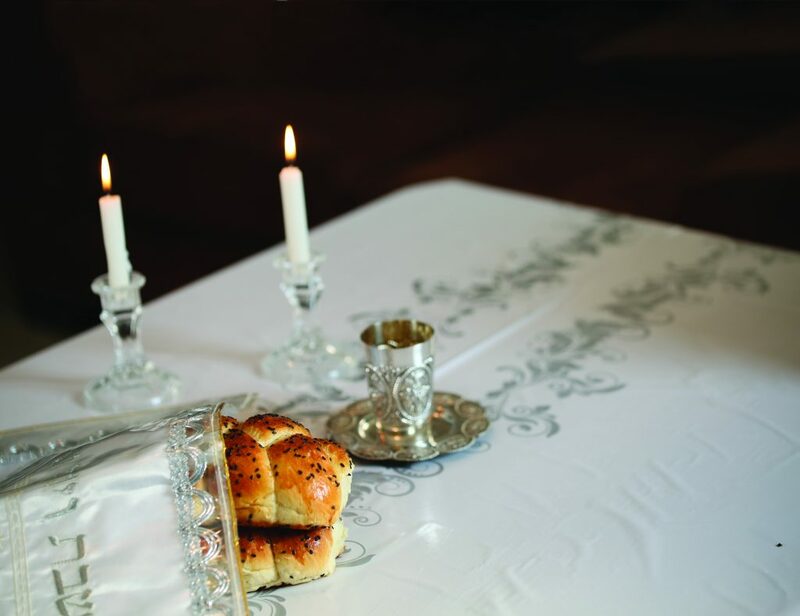 A Shabbos meal full of spirit and inspiration can become the new reality in your home. Grow, and watch your children grow with you.